Skyn Iceland is a fab company that offer a range of paraben-free beauty products. One of their products in particular caught my eye and I picked up a pack of 8 pairs from M&S. 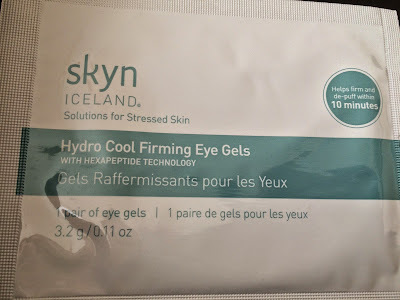 They are cooling gel eye pads which contain Co-enzyme Q10 and Ginkgo Biloba. Having worked at Holland and Barrett for a long while, my interest was certainly sparked. I was already aware of the benefits of Co-enzyme Q10 for skincare. It aids in the repair of the skin by boosting the production of collagen - protecting the skin cells from oxidative stress. The Ginkgo Biloba tree is actually a living fossil native to China, possibly dating back over 270 million years. I have been recommending this product for memory (cognitive diseases such as Alzheimer's and Dementia) and circulation in my job. I didn't know that Ginkgo had any benefits in terms of skincare but it makes sense as it aids circulation. So the idea is that it will reduce under eye circles and puffiness by promoting circulation. I really love this product, I've found that it really does calm down my under-eye area. I use these pads before a night out or after a particularly long week at work when I'm not looking my best. They really do de-stress my skin and relax me. They are so cooling and just a pleasure to use! I have found that since using these weekly, my under eye bags have definitely reduced in severity. I don't really need to apply concealer under my eyes in the morning like I used to, unless I want them to look super brightened. I recommend these to all. Even though they seem expensive, you get 8 uses out of them and it's much cheaper than going to the salon or spa despite the quality and results being just as good!